An old boss of mine says unintended consequences is merely the failure to adequately consider the implications of the decision being made. The location of the Bridgwater Tidal Barrier (BTB) is probably the most significant decision Sedgemoor District Council has made in many years. Rarely can such an important decision have been made with so little debate. If it’s in the wrong place we and the following generations live with the consequences for the next 200 years or so. No one is giving us another one if its wrong. On the 26th July 2017 a full Sedgemoor District Council meeting agreed the location of the Bridgwater Tidal Barrier. This decision according to the minutes was apparently waived through without discussion. That the EA and SDC gave a superfical 3 page briefing document with so few key facts indicates just how confident EA and SDC officers felt able too simply ignore the longer term collateral environmental and economic impacts of this scheme. It is a clear indication of the low esteem our councilors are held in. Councillors lack of oversight of this scheme does indicate the officers probably wernt wrong. Silent oversight committees seems to have presided over continued and unsatisfactorily explained cost rises. The cost almost doubled in the the six months after the decision was made. Barely a word was said. Abandoning 1,400 acres of valuable land next to a motorway junction capable of supporting £1B of future investment (jobs) whilst unnecessarily forcing future housing onto the Quantocks foothills extending Bridgwater to absorb Cannington, Spaxton and North Petherton. This decision will be seen as one of the most irresponsible and reproachable acts by councillors of any local authority at any time. SDC knowingly made a decision to convert the Parrett Estuary into an Intertidal Habitat and behind the the secondary flood defence create more areas of habitat suitable for freshwater mosquitios such as the Zika and Denge carrying Asian Tiger Mosquito to take up residence. Limiting economic expansion, building on the Quantocks, poisoning the fresh water ecology of Chilton Trinity and Pawlett Hamsand and creating a future health hazard is hardly what we people voted councillors into office for. If they did know why did they do it? If they didnt know why not? The details of the proposals for both the barrier and the downstream flood defences. How you think the proposals may affect you, your land or your business. What additional improvements you would like to see delivered as priorities, in addition to the barrier and the downstream flood defences, subject to funding. Large civil engineering projects influence long-term economic development as we have seen with development taking place around our motorway junctions; the proposed Bridgwater Tidal Barrier (BTB) will influence Bridgwater’s future development in a similar way for at least the next 200 years. The Bridgwater Vision published in 2015 and referred to in the presentation identified land for future development most of which is either now approved or starting to be built out under the local plan. Bridgwater is already reaching the limit of land that can be easily accessed from the town and the M5. Assuming Bridgwater continues to develop economically at even half its present rate, during the design life of the BTB, an additional 25,000 houses will be built and together with land for employment and Bridgwater’s footprint will grow by around 40%. Under the present BTB scheme low quality farmland directly beside Junction 23 that could have provided space for at least £1B of economic development, housing and jobs will be lost to the town. Alternative land over the next 100 years will need to be found and that will invariably mean development moving on to high quality agricultural to the south and west of Bridgwater. We will build on the land that feeds us whilst living ever farther from planned and established centres of employment to the north and north east of Bridgwater (Horsey). Building at Horsey will require a new bridge over the King Sedgemoor Drain; money that could be used to cross the Parrett and bring forward a much needed northern bypass. The reader should take cognisance that the two options studies done for this scheme, the first included highly improbable options such as the Bridgwater Bay power lagoon and outside the influence of the authors. The second option study looked at the same solution at a limited number of locations and would always arrive at the narrowest part of the riveras the prefered solution. It was a superficial study and lacking rigour and at the time of this note the final information used by an SDC sub group remains unpublished despite an FoI request to Sedgemoor District Council remaining outstanding. Other options and locations to protect Bridgwater and the downstream villages were available but not considered. The Bridgwater Tidal Barrier is a 7mile long inland tidal surge flood defence scheme with a 100 year design life based on sea level rising around 800mm during this period. Similar to the current Thames Barrier it consists of a two elements. 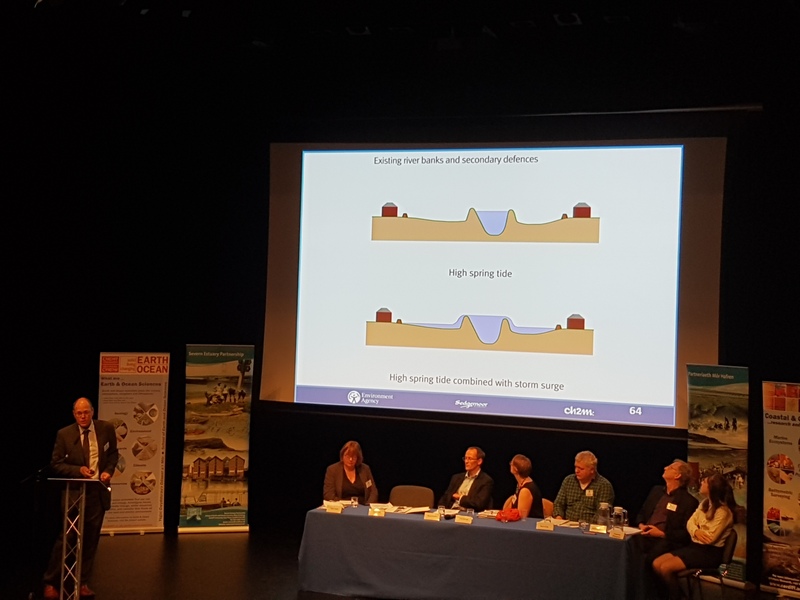 Riverbanks profiled to preferentially spill seawater, during extreme tidal surge conditions, onto farmland at Chilton Trinity and Pawlett Hams. A small double vertical floodgate barrier located in the industrial and employment Express Park area of Bridgwater and approximately 1 mile from the town centre. The replacement Thames Barrier will be sited more conventionally at the mouth of the Thames; Combwich is Bridgwater’s equivalent location. The height to which the riverbanks can be raised is limited by the poor ground conditions. Although needed no provision of any kind for a replacement is considered. Constrains economic development to the northwest of the town. Significant loss of existing freshwater habitat in line with managed realignment policy 7d39 of the Shoreline Management Plan to create an intertidal habitat. The closure of the barrier at low tide creates a separation of the two types of water that use the River Parrett. Upstream freshwater from the Parrett and its tributaries such as the Tone; Yeo and Cam will be impounded behind the closed gates. Downstream the freshwater will finish emptying into the Severn and the then the empty river filled with seawater on the incoming tide. All flooding shown downstream of the Bridgwater Tidal Barrier will therefore deposit salt water onto the land. This is saltwater and the impact should not be confused with the 2014 event. The land in question at Chilton Trinity has not been flooded with salt water in this way within living memory. Pawlett Hams was briefly flooded in the early 80’s and flooded Pawlett from the north where no flood defences are planned. What is clear is that considerable ambiguity remains in the proposal. Many issues are simply ignored or the messages contradictory. The following summary and notes provides some comments that should be addressed. It is disappointing that such an important scheme appears to have been given so little strategic thought whilst the barrier appearance and immediate landscaping seems to have received considerable if unsuccessful attention. Clearly the priorities of the design and client team are not those of the ratepayers who do not need a solution where the medicine kills the patient which is what we appear to have. One consistent underlying theme is that once the barrier is built the land to the north and south, Chilton Trinity and Pawlett Hams, will ultimately become intertidal habitat in line with existing published policies. Planned flooding of agricultural land with saltwater. The claim made “Bridgwater and the surrounding area will be better protected against a severe flood by building the barrier and improving the downstream flood defences. These works will also maintain the current standard of defence to agricultural land”.is misleading to landowners indicating that farming will simply carry on as normal. With the frequency of saltwater flooding increasing the land will not support the type of grass needed for agricultural. Areas of Norfolk are still recovering from single sea water incursion 65 years ago. No location for the pits was given, which side of the secondary flood defence. It would not be unreasonable to assume between the river bank and the secondary flood defence. A rough estimate would indicate that the scheme will need around 100,000m3 to 150,000m3 of clay creating a large open area (7-8Ha) of stagnant water that will through our now warmer summers become more saline as they will operate as a large evaporation pond. That mechanism does not allow the wildlife enhance described to occur. A number of claims are made regarding the lack of environmental impact that this scheme has on the ecology however changing the habitat from freshwater to saline will fundamentally change the area in line with the published strategy of changing the land to an intertidal habitat. 2,400 acres of fresh water habitat is destroyed through repeated seawater flooding. An estimate of £94M is given in the EA presentation. Through a FoI request (03 April 2018) The EA provided an estimated whole life cost closer to £160M. That estimate assumed £12.4M Net Present Value or £55M cash cost over 100 years including for maintaining and rebuilding the riverbanks that is around 4x the value of the land. Economically this statement on maintenance costs makes funding the future bank rising impossible. If the circa £100m estimate is correct this would cover the gate maintenance and not the riverbanks. £100M with one set of the riverbank improvements at the time the barrier is constructed. £160M with three sets of the riverbank improvements including the time the barrier is constructed and subsequently at 35-year intervals after that. That must be the budget. This scheme is presented at completion in 2024 and looks only at immediate local impacts. Construction will have immediate and long term wider negative consequences for Bridgwater none of which have been raised or addressed despite written assurances that that would not be the case. Loss of 1400 acres of key land suitable for £1B of economic investment for housing and industry that is directly accessible to Junction 23. Creation of a working flood plain over which a potential bypass might need to be constructed. Increasing separation of housing from employment by forcing development elsewhere. The loss of in existing land values of around £12m and potential bankruptcies where the land is used to secure business loans. Destroys 2400 acres of fresh water habitat through deliberate seawater flooding initially during extreme tidal events but ultimately becoming within the normal tidal range. Forces development to take place on high quality agricultural land to the south and west of Bridgwater. Forces apart residential and employment areas with a consequent long term cost to the economy and the environment. Places increased demand on the A38, A39 and Kings Drive as industrial development is forced east to Horsey and to the approved BAE industrial site. The barrier superstructure is 2 to 2.5 times higher than it needs to be and lacks any shape that reflects its functionality. It achieves the rare combination of being both pretentious and mediocre. With a structural volume that must be four times what could be reasonably required to support its function it is bloated, unnecessarily expensive and will be difficult and expensive to maintain. Overhanging shapes require specialist access equipment for maintenance. Everything on the structure seems designed to cost more than is necessary. Its appearance seems to owe more to Mr Blobby and the Teletubbies than the Falkirk Wheel, it doesnt do anything like the Falkirk Wheel so hardly a tourist attraction. The poor design of this structure extends to the gates, rather than protect the gates from the salt loaded wind driven rain, the site is classed as a marine environment, rain will be spilled from the ovoid bridge onto the gates increasing maintenance and reducing the life of the gates. As a piece of architecture and a piece of engineering this structure almost certainly fails on cost, function, operator safety and buildability. Storage Buildings are provided when the EA has a depot nearby at Bradney. Did no one ask why we need additional buildings at the barrier site? Presumably they would also attract rates? The EA was more than happy to bring excavated material from its Cannington flood project to Chilton Trinity yet the more sustainable option of building the banks over a longer period using spoil from building sites is not considered. It’s not as if the defences need to be at their final levels until the last planned rebuilding of the banks 35 years before then end of the design life. This work could be done on an opportunistic basis over the next 50 years or so in a sustainable cost effective method by local contractors. The continuing reference to 2055 that is key date in the shoreline management plan indicates thatany future raising of the river banks is unlikely to occure. This process would also assist in maintaining accesses and local resources able to respond to urgent requirements such as a breach in the river bank. Finally just to prove the point the EA/SDC presented on page 7 of the stakeholder presentation three images of unrelated events to support its postition. West Quay collapse, an old wall collapsed when it got too much water behind it; we see thse failures alongside our roads all the time but we dont try and link them to climate change or a tidal barrier. The 2014 flood was a pluvial (rain) event and the Bridgwater Tidal Barrier is not designed to mitigate a repeating event. There is clue in the word Tidal. Unfortunately many people in Bridgwater and the surrounding area believe that it is part of a pluvial flood defence scheme. Perhaps an SDC, Town or county councillor reading this might decide to ask some serious questions about this project, one can only hope. The impact of wildlife organisations on locally managed flood projects is a concern. They seem to be free to make unsubstantiated statements whilst pursuing their objectives with little public visibility, criticism or professional oversight and it is a growing problem. It is a situation becoming increasingly familiar and yet another example of our growing democratic deficit where minorities impose their ambitions on the majority. The Somerset Levels, the Parrett Estuary and Bridgwater’s need for a flood defence from the sea has brought many of these parties with their own agenda to one location each focusing on what they consider to be important. Bridgwater seems to be well down the list of importance despite the planned construction of the Bridgwater Tidal Barrier. The purpose of this article is to provide an explanation as to how this is happening. Bridgwater currently builds around 500 houses a year and if that rate continues at even half that rate for the next 100 years we could expect to see the number of houses in Bridgwater rise by 25,000 taking another 700Ha (1,700 acres) of land for housing and a further 300Ha needed for employment. 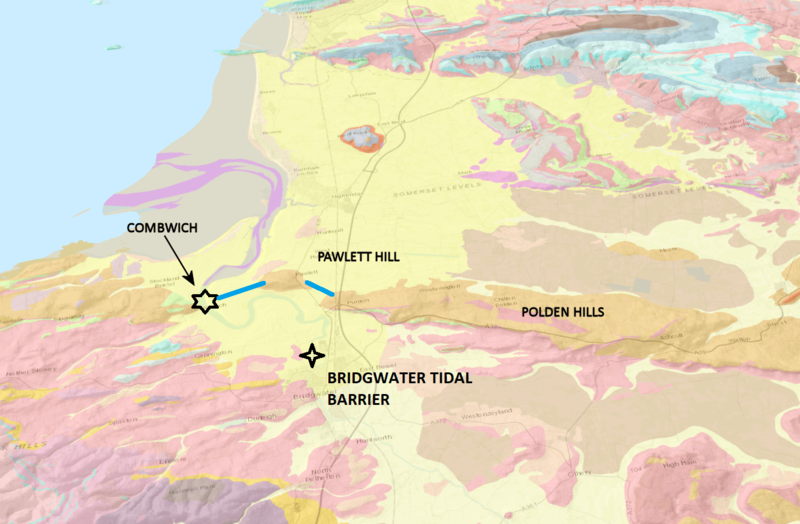 This 1,000Ha’s will see Bridgwater’s existing footprint grow by at least 50%, The 25,000 houses and associated economic development will generate perhaps 300,000m3 of clays and soil waste. With flat and level land needed for employment land at the old BAE site and at Horsey offer the only other viable employment options to Bridgwater and they are to the northwest. New housing will be forced onto good quality farmland south along the A38 swallowing up North Petherton and eventually meeting Taunton coming the other way and to the west developing the land between Bridgwater and Cannington. Bridgwater will consume its high value agricultural land on the hills as it, like the rest of the country, continues to build our outdated ideas of housing. Bridgwater will therefore become an even more difficult place to live and work as the gap between residential development and employment continue to grow. Every day a large part of Bridgwater’s population will get up and drive along the A38 and A39 to get to work. Bridgwater will not even start considering a bypass until 2040. Apart from the normal lack of imagination by planners and developer’s Sedgemoor’s (Bridgwater) greatest problem now appears to be the wildlife and flood pressure groups that seem to take an extreme view in the pursuit of what they consider to be in their interest. They show little tolerance or understanding that people also live on the Levels and in Bridgwater and ignor the EU directives that accept people must come first. The true impact of their objectives is concealed and never addressed. These organisations also seem immune from any need to consider facts in their statements whilst criticising property developers for the smallest omission. The irony that is they now ape those same commercial organisations in assembling land and changing its use without considering its long term impact on the wider local population and it should be lost on no one. The local economic benefits alluded to as part of the original Steart Peninsula planning application remain unproven and therefore represent little tangible benefit to the local population yet quoted as fact by The Severn Vision statements. 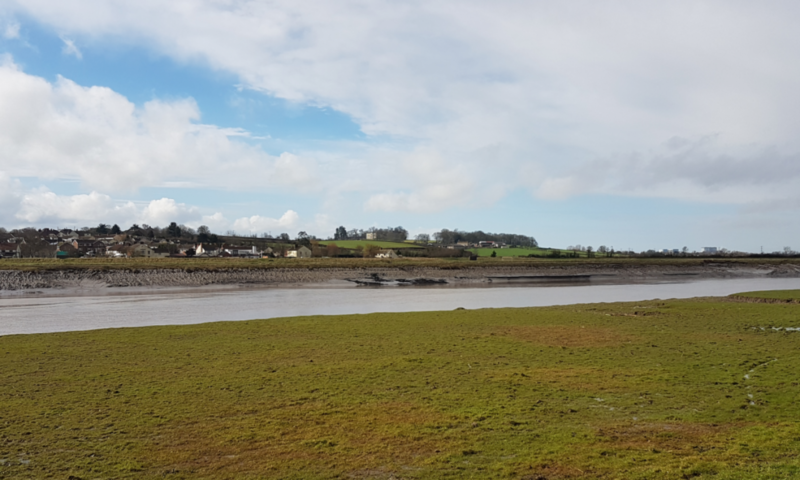 This plan will expand the existing saltmarsh by 833% around the Severn Estuary and in Bridgwater’s case large areas of agricultural land removed from food production and converted from a freshwater environment to a saltwater one (intertidal habitat). 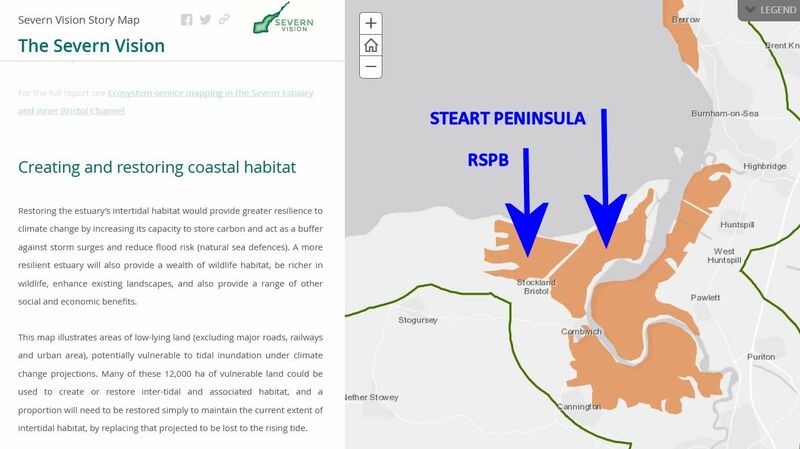 To date two phases have been completed; The Steart Peninsula and the RSPB reserve (funnded by Bristol Ports) both of which remove economic activity and destroy an existing habitat to create another. A process little different from modern housing development. Whilst an argument might be made on the basis of geography for these two areas to be returned to the sea no such argument exists for the destruction of Pawlett Hams and Chilton Trinity including areas of the SSI. With regard to Bridgwater it makes claims regarding carbon savings whilst ignoring the collateral effect of moving Bridgwater’s housing developments onto higher quality agricultural land and increasing commuting distances. Also ignored is the loss of food production on 5,000 acres of land and the transfer of that food production overseas. It is particularly misleading in its statements with regard to Bridgwater providing no supporting evidence as to the negative benefit that it has considered in any balanced and holistic way. It is completely one sided yet already two key elements have been delivered, Steart Peninsula and RSPB reserve. The Bridgwater Tidal Barrier will deliver the southern land at Chilton Trinity and Pawlett Hams . The Environment Agency and Sedgemoor District Council’s Dec 2018 public consultation made a claim with regard to the lack of any environmental impact of this scheme. 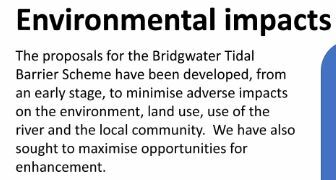 The EA and SDC have not considered environmental impacts beyond the immediate area of the scheme despite this scheme imposing restrictions on economic development forcing residential development to the south and west of Bridgwater and employment to the northwest of the town. It is worth noting that HPC looked at issues far beyond the immediate area of the power plant when it did its enviromental impact assessment. Seawater is shown overtopping the river banks onto the existing farmland, the fact that it is seawater is misleading. The existing wildlife that requires a freshwater environment will be destroyed. The location of the borrow pits, which side of the secondary flood defence, was not shown. The plan to excavate 100,000m3 of material will create a lake of nearly 13 acres that will act as a reservoir for saltwater. 1,400 acres of high quality farmland suitable will be unnecessarily developed invariable towards North Petherton and Cannington as this scheme will convert 1,400 acres of low quality farmland that could have been used to saltmarsh. 100 years of lost food production on 2400 acres of farmland. Denying economic development in the north-west will increase commuting efforts in the local community generating avoidable C02; the scheme ensures the increased separation of employment areas from housing. The claims regarding this scheme are questionable at best and the lack of information misleading at worse. The extract from the EA/SDC public display indicates a plan to create a stepping-stones for species that are not identified. How allowing saltwater (seawater) onto productive farmland that has taken 500 years to remove the salt from seems a strange way of protecting our countryside. Another supporter of The Severn Vision. Since the 2013-14 flooding events, the dominant narrative in the floodplains has focussed on hard engineering schemes and dredging to reduce flood risk, overlooking flood risk reduction techniques that work with nature and provide a range of benefits to society. A future is developing where more public money will be spent on fossil fuel intensive dredging and pumping, to further drain the peat soils of the Levels, thus releasing more carbon and exacerbating climate change. As peat is drained, it shrinks, lowering land height and making the area ever more vulnerable to extreme weather. Well-informed debate on the future of Somerset’s low-lying areas in the face of rising sea level is limited, so a further vital part of our work on the Levels is to communicate a more optimistic narrative which gives nature its proper value. This statement ignores that the Somerset Level’s is an artificial environment that needs regular maintenance and seems to conflate the need to dredge Somerset’s rivers and the need to get pluvial flows from the upper Parrett catchment areas to the sea bypassing the levels storage with an idea that somehow this process is designed to shrink the peat. “A future is developing where more public money will be spent on fossil fuel intensive dredging and pumping, to further drain the peat soils of the Levels, thus releasing more carbon and exacerbating climate change” is a particularly spurious and misleading statement. It sounds like people are secretly pumping water off the levels as some sort of conspiracy. Anyone with any knowledge of the Levels would know that retaining water levels is just as important to the Levels as draining them. No one is going to drain the peat. Well informed debate requires informed knowledge and that is clearly not the case with this statement by the SWT. FLAG reflects its single issue origins seemingly taking its position on Somerset’s farming industry geographically from the lands relationship to Moorland and what is best for Moorland. A post (Nov 2018) supporting Somerset’ s farming industry on the Levels was made by FLAG making Brexit the largest threat to farmers in anticipation of a nonexistent trade deal with the US; no doubt the cause of the 2014 flood and global warming will in time also be subscribed to Brexit. FLAG’s postion downstream of Moorland at Chilton Trinity and Pawlett Hams is quite different. Flag is altogther less compasionate regarding the farmers there having their land flooded with saltwater to alleviate upstream flooding. Concern is simply dismissed by a statement worthy of Marie Antoinette “let them raise salt beef or lamb”. It completely ignores that the Bridgwater Tidal Barrier has already destroyed land values for 2,400 acres of land and food production we might have gained. Reverse nimbyism seems to apply; as long the flooding is on someone else’s land FLAG appears to be happy whilst refuses even the smallest tacit support for or willingness to consider alternatives tht might have a better outcome for the wider community. Whilst our wildlife organisations may have started with good intentions what is clear is that many people associated with these organisations simply don’t understand the mechanisms of the Somerset Levels, the impact of what they propose (The Severn Vision) and in most cases don’t care if it doesn’t suit their agenda. They fail to consider that ultimately the economy pays for everything and destroying local economies will ultimately call into question the viability of protecting our environment; the ratepayer maintains the roads used to get to our wildlife sites and will pay or make a significant financial contribution to the cost to the current planned defences and the their subsequent replacements. A case of shooting the goose that lays the Golden Egg of in this case chasing away industry and people. It is clear that many organisations support the existing proposals to turn the Parrett Estuary into a saltmarsh. The decision by SDC and the EA not to commission an economic impact assessment has allowed those organisations and the Environment Agency to create the worst possible long term economic future as there is no assessment mechanism other than the government investment rules to measure the value of this scheme. Allowing the undermining Somerset’s agricultural industry, wasteful development and not working towards an integrated low energy society is not what we should be doing. Ahead of the forthcoming last public consultation on the Bridgwater Tidal Barrier (BTB) the rate and tax payers might consider asking what becomes of Bridgwater after the BTB reaches the end of its design life? if there is no barrier capable of keeping the rising sea out there will be no house insurance, no mortgages and Bridgwater the town will not be a viable place to live. Our present proposed EA flood defence scheme is based on retreating as far back from the sea as we can, it deliberately puts our backs to the wall On one side of the barrier we will ultimately have the inter tidal habitat (the sea) and on the other our housing and industry. No space is being provided behind the proposed barrier to create another bigger one. As a consequence there will be nowhere to go with a replacement that does not have a huge and unnecessary price tag. There is an irony that land at Chilton Trinity returned to the sea under the present scheme and the planned managed realignment in 2055 will be inadvertently reclaimed under a downstream replacement barrier albeit land now poisoned with salt. With sea level rise continuing for hundreds of years past the design life of the BTB one would expect that as responsible people we would give some consideration to what happens next. Unfortunately, like so many things in need of fixing and investment we seem content to kick the problem into future refusing even to consider how we might make some provision to help those that follow us. Many years an Arup engineer called Poul Beckmann wrote the opening sentence of a document with the line “Human nature is that we put off until tomorrow what we should do today”. Never has that been more true today than in Somerset. Somerset’s failure to develop a realistic, affordable and sustainable long-term strategy is unforgivable. It really is time for some of the promises made by our political leadership on this issue to be delivered and people stop making excuses why things cannot be done. Simply working our way through the Somerset 20 years plan and saying the future is not our business is irresponsible and unacceptable. The SRA was asked “What is the SRA and its partners working assumption for the replacement of the existing scheme and barrier? From day one, the tidal barrier will be designed in such a way that it will still provide a 1 in 1,000-year standard of protection in 2125. The design includes an allowance for climate change up to 2125. Climate change does not stop in 2125!!!! 1:1,000 sounds good but its just the margin on the starting point and degrades over time. The Dutch use 1;10,000 and maintain it as the level of protection. The downstream defences will be designed in such a way that they will still provide a 1 in 200-year standard of protection in 2055, with allowance for further adaption for climate change over time. 2055 is important because this is the date from which managed realignment is implemented under Policy 7d39 of the Shoreline Management Plan. It is to be expected that any piece of infrastructure would need updating after 100 years. We cannot decide now how future generations may wish to live or what their priorities for infrastructure will need to be. This is why, for example, there are plans for the Thames Barrier to be re-built in future decades but decisions on exactly where and what will be required are deliberately being left for later. Building the barrier in the town as planned does not give those in the future choices but leaves them no choice to but to go downstream and use land we have previously given back to the sea and to abandon the £100M investment the present scheme will have cost. The response attempts to conflate the need to replace the 1970’s Thames Barrier as a reason not to make provision today for a replacement in Somerset. if you know you have to replace something why would you not plan for the replacement? Its an excuse. We should be learning the lessons of the past rather than making a virtue of repeating the failures that the SRA reply implies. 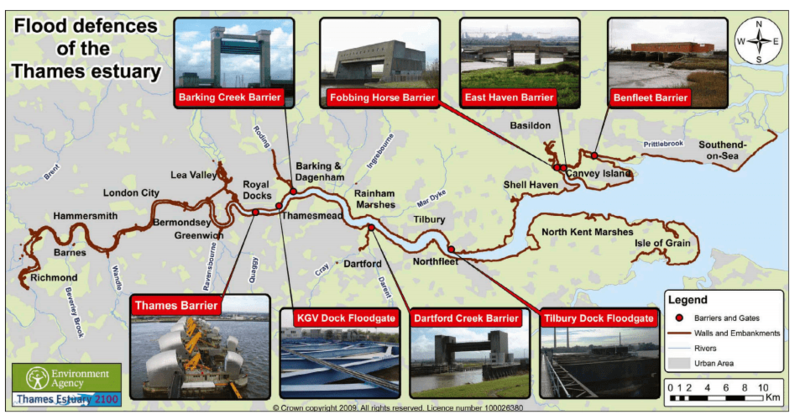 The continual portrayal Thames Barrier shown on TV as an iconic single barrier solution is misleading; the barrier is actually part of the Thames Estuary flood defence system comprising not one but eight individual tidal barriers that all shut together. Five of the eight barriers are closer to Bridgwater’s situation than the “Thames Barrier”. They are however where they should be at the mouth of the rivers they defend not 5 miles upstream as with Bridgwater’s Tidal Barrier. Using the Thames Barrier as an excuse for not planning a replacement in Somerset is particularly disingenuous for a number of reasons. Nearly 60 years ago when the Thames Barrier was designed climate change was not understood as it is now. There was little provision for sea level rise just the post Ice Age tilt of the south of England to consider. The Thames Barrier is upstream of what were active docks that had navigation rights in the Thames Estuary. In Somerset we have a topography in the form of the Polden Hills, Pawlett Hill and Stockland Bristol that we can link and use to our advantage. London does not have such a luxury. The most frequent use of the Thames Barrier is now the management of fluvial flood water rather than tidal surge. Something Bridgwater is not designed to do. Sedgemoor District Council is able to reserve space for a bridge over the Parrett south of Dunball should its not be doing the same for a replacement barrier? The collective response is No ; there is no plan. Once the question “how will the proposed Bridgwater Tidal Barrier be replaced?” the present scheme simply looks out of date and poor value for money. The Bridgwater Tidal Barrier is repeating the same mistake as was made with the Thames Barrier system setting it as far upstream as possible. Because of the selected location a replacement would like the Thames Barrier have to go downstream towards Combwich. Confused? We should be. What becomes of Bridgwater after sea level rise exceeds the design basis of the Bridgwater Tidal Barrier? Why is there no long-term plan or vision for what comes next? Why is the ratepayer required to provide money to raise river banks money protecting land at Chilton Trinity when the planned sea water flooding will make it of no economic value? Why is not improving fluvial flow in the river system part of the scheme? Why did the cost of the scheme almost double after the location was decided on? The UK has a serious problem with leadership and sustainable construction where flood defence is concerned. There is a profound lack of critical thinking in the delivery of future UK flood defences and an unwillingness by agencies to get their hands dirty at a local level. As a consequence government continues to fail regarding sustainability and value for money; taxpayer funded agencies seem unable or unwilling to work together. It is a situation compounded by wildlife and environmental organisations who have seen an opportunity to gain control of and modify land in much the same way that monasteries such as Glastonbury once did. Flood defence schemes are invariably seen in terms of a definable project that can be closed rather than the first step of a sustainable long term solution. The protected community needs to live with and manage these schemes for 100’s of years after they are built. Our thinking on delivery is just too short and too expensive when it is a 300 year or so problem and especially when the initial solution only has a 100 year design life; it makes little sense. There is an obvious gap. That gap means that today’s options should at least consider what happens next. Should we really be adopting a solution today requiring the construction of a replacement barrier tomorrow rather than a scheme today that has provision or a plan for extending it already built in? Our current scheme takes planned obsolescence to a new level. Delivery of the Bridgwater Tidal Barrier continues to be an exemplar of non-sustainable thinking. Part of the scheme requires the river banks between the tidal barrier and the village of Combwich to be maintained. The EA’s plan to do this work as part of the barrier construction contract. Material is to be dug from the adjacent protected fields and where a future Northern Bridgwater Bypass might be routed. Sedgemoor District Council (SDC) have protected in the Local Plan a potential crossing point on the River Parrett just south of the A38 roundabout at Dunball. Clearly excavating Chilton Trinity’s fields and creating a series of salt water pits that creates an ideal future breeding ground for salt marsh breeding mosquito’s is not what people have considered the consequence to be. It is far from impossible that in a generation Chilton Trinity and Combwich may ultimately become uninhabitable because of this excavation process rather than from the increased flood risk. Managing mosquito borne diseases may well become the larger challenge in low lying areas as our climate warms up. It is difficult to see how the EA could contemplate the creation of such a situation. With whole life costs of the Bridgwater Tidal Barrier reaching £100M for a barrier, secondary banks and the raised river banks; banks that need continual raising means we need to consider modification of the delivery model to get the costs of this project under control. That whole life cost also ignores the 100 year economic impact, both locally and nationally, of losing 1000’s of acres of productive agricultural land notwithstanding the questionable morality of a food importing country choosing to export more of its food production offshore. If we are going to build the solution we have we need better and more economic delivery solutions than is currently proposed. We can then at least ameliorate the present situation with a better delivery system. Brexit allows the modification of the EU water and waste directives that have now been written into UK law. We can now change the way in which we manage waste for the better. Every year Sedgemoor will build 5-600 houses and the excavation of foundations and drains for each of these houses will create around 15-20m3 of waste material (clay) suitable for re use as bank raising fill material. Sedgemoor’s planned housing developments will create around 9,000m3 per year that currently must be paid for to be disposed of. Housing developers could supply all the material needed to raise the banks. That is sustainable construction. Over the 100 years life of the barrier there could be as much as 900,000 m3 of material we need to find a home for; material that could be used to build up the banks and preserve the land we have at Chilton Trinity for future generations. Even if the volume is only 10% of the possible amount its probably enough to avoid digging up land at Chilton Trinity. Under present EA proposals the EA is going to pay landowners for material that other organisations with similar material must pay to dispose of. We are meant to be reducing this sort of activity not making the situation worse. We simply don’t need to get all the work in place in 2024; we need just enough to maintain the flood defence need and then use local resources to progressively deliver the longer-term solution with a local benefit to the economy. This work could be collectively done by local contractors under the supervision of either the EA or the Drainage Board. There is simply no engineering need for the EA to wantonly and unnecessarily destroy our landscape when cheaper and more sustainable alternatives are available. build a bank 5m high bank from the Bridgwater Tidal Barrier to Combwich. raise the banks and build the secondary flood defences up to match climate change. raise the banks, build the secondary flood defence and start building new defences north from Pawlett Hill towards Highbridge. Sea level rise is not expected to slow for at least 300 years making both the barrier redundant as the river banks can only be raised perhaps another metre before they overload the poor ground conditions of the Parrett Estuary. Ultimately the long term plan for Chilton Trinity and Pawlett Hams’s will be realised. The continued conditioning of the population by the EA to passively accept surrender to the sea as the first option for non-London areas of the UK is disingenuous and defeatist and never mind its land we need to grow food on. An independent inquiry into how flood defence is being delivered in Somerset. A peer review of the BTB project into how it has arrived where it has. 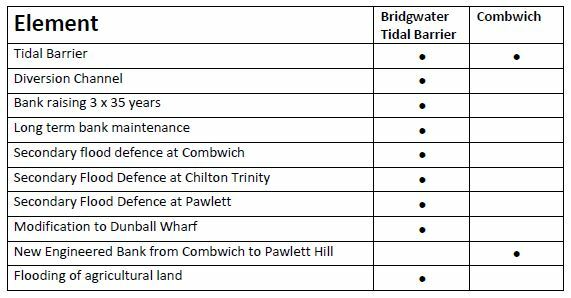 The option of building the Bridgwater Tidal Barrier at Combwich was always affordable and as we now see the full whole life cost of the present scheme being made public its clear the best location was never considered. Combwich would be a conventional location for a tidal barrier as its near the mouth of the River Parrett. Combwich is a unique site that would offer Somerset a long term solution to protecting the southern Levels as a barrier and associated embankment would close the narrow gap between Stockland Bristol and the Polden Hills via Pawlett Hill. The location also offers an appreciable increase in the fluvial conveyance capacity of the existing River Parrett catchment river system. Original image is courtesy of the British Geological Society. The yellow colour in the above image is the soft clay deposited around 11,000 years ago. The existing river banks will see the new flood defences from Combwich up to the site of the proposed Bridgwater Tidal Barrier built on this soft material that is up to 20m deep. Defences that due to settlement will need to be built back up every 30-35 years defending land that will have been flooded with saltwater. The argument is that it’s the cheapest solution where it is in Bridgwater. People continue to believe the width of the river and the length of the barrier structure is the only driving cost of the scheme. Whilst size does matter it is not all that matters. Like most schemes that start without a clear direction the final cost proves to be significantly more expensive than expected and the Bridgwater Tidal Barrier is no exception. The EA project team didn’t understand its costs just its objective. They are not the same and nor are they aligned with securing Somerset’s long term future. Most people are aware that present scheme originated from a 2009 scheme that was little more than a knee jerk reaction to climate change and the long-standing need for a control system in the river. What we have seen is that inexperience in project delivery saw the early focus on one element of the scheme rather than the scheme as a whole. Effort was exclusively focused on the barrier, the type of gate and location within a short length of the River Parrett and it clouded objective thinking about an holistic scheme. It was so bad that the EA team doing the barrier were unaware of the test bank being done by the EA and Team Van Oord; there was simply no joined up thinking. Nobody at that time or since has been willing to stand back and take a cold hard look at what was needed when the Cameron Government’s political promise of post 2014 flood money removed critical thinking from the delivery process. The simple fact is that every activity has a cost and the choice the client and the designer has is where you spend the money today and tomorrow. A simple comparison of where our money will be spent is produced below. You can spend money on lawyers and land agreements for secondary flood defences or spend the money on a better barrier. Paper does not keep the sea out. Combwich offers a number of advantages that offset the barriers extra length and the constraints of the present location in Bridgwater. These advantages include the use of precast concrete construction, the availability of space for construction, no need for an expensive diversion channel and the long periods when the river is empty make considerable cost savings. The key savings are given below. 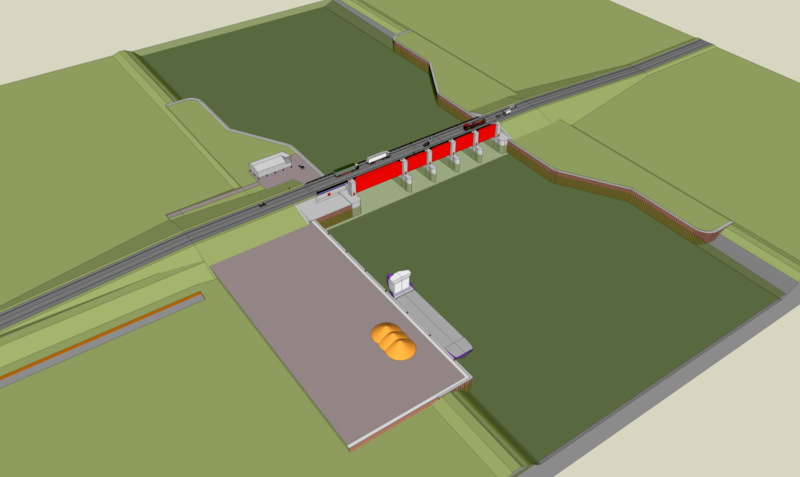 a barrier structure could also support a future bypass. The good thing about the River Parrett and there are very few is that its possible to work on the river bed without the need for a coffer dam. If you have the space and you’re in the infrequently used navigation channel of the Parrett you move and do things in the water during high tide and then drive down the bank onto a prepared river bed. and work during low tide. The January 2018 news that the estimated cost of the Bridgwater Tidal Barrier (BTB) had reached £100M caused the BBC last week to interview stakeholders at the EA, Sedgemoor and Bridgwater Town Council. Anyone who heard the interviews and knows anything of the history of this project will be as equally concerned as Bridgwater’s Town Council. The risk regarding withdrawal of funding is real; Government will not accept being led on and neither should the ratepayer which is becoming the real story of the Bridgwater Tidal Barrier. The EA chose somewhat disingenuously to blame the hike in price on the Government making a perfectly normal and responsible demand regarding cost information. Information not previously provided to the SDC ratepayer. It was clear during the public consultations (the boards are still available on the SDC website) that the selection method (river width) was flawed in ignoring the cost of the downstream works and the associated maintenance costs that went with them. Cost confusion about this project has been a problem ever since work started on developing options and presenting the options to the public. Previous written responses raised this issue in March 2016 and nothing was done to clarify the situation in subsequent public consultations. The well known poor ground conditions of the Parrett Estuary were again blamed. Ground conditions have become a convenient hook to hang cost increases on. If the costs associated with ground conditions are being continually underestimated at such a late date there is clearly a management issue that needs to be fixed. SDC again conflated Cameron’s “never again “statement made in 2014 with the Bridgwater Tidal Barrier. People will continue to imagine that the Bridgwater Tidal Barrier will somehow mitigate a 2014 flood when that isn’t the case. The defence of the cost is indefensible. The reality is that neither the EA’s technical management team, those responsible for providing senior project management/Governance (EA/SDC) or the councillors providing oversight have the necessary experience for a project like this. (£29M was beyond their reach and £100M is farther still and requires experienced management). The BTB was always going to get away from under them as it clearly has. As a contributor to the EFRA Future Flood Prevention report in 2016 I highlighted the issues that are deeply embedded in this project. Entitled Managing local UK infrastructure; the Client Deficit. it highlighted the lack of an independent adviser to stakeholders as a continuing problem with UK locally managed infrastructure projects, it is a situation repeated elsewhere and in Somerset the SRA is a particularly good example of people being responsible for delivering projects that they are not experienced or qualified to do and not being provided with the support they need. The KSD expansion project seems to be struggling in a similar way to the BTB. Googling ones mobile phone is not a valid substitute for experience nor is having laid a patio in earlier years. We all now understand that the Bridgwater Tidal Barrier solution (location) was driven solely by the promoted idea that “river width” somehow equated directly to project cost; getting the barrier as far upstream (narrowest point) was the cheapest option for the EA. it was always a flawed strategy and the cost we are now seeing is the result of that approach. It is the result of not doing work that should have been done during the options study. The initial cost of the downstream raising of the river banks and the cost associated with the intent to continue to do so does not appear to have been fully considered in the original location decision. Unfortunately, valuable and costly time was spent on what sort of gate we should have had rather than looking at the overall solution and there was no challenge to the 2009 B&V spread of locations. Long term costs and the EA’s rather ambiguous position regarding the long term raising of the river banks were conveniently ignored in the 2016 public consultations. Consultations that completely ignored the principles set out in Government guidelines on public consultations. This situation was compounded by the obvious client project inexperience shown in the rush to engineering studies before an outline plan was agreed that always results in the cost escalation we are seeing. The sudden arrival of the secondary flood defences is something that should have been highlighted in the option studies, it may not have been needed at sites farther downstream and was not shown in the early public consultations. After 30 years of managing the design process on much larger projects than the BTB starting a project without a real plan is always a trap waiting for the unwary. Sadly, as a result of the BTB execution strategy what we now have is less normal project delivery and more an episode of Grand Designs. At least the consultants should avoid any blame. What was striking in last week’s radio interview was the lack of any new arguments after all the work that has apparently been done to support the scheme in its present form. What is equally impressive is that both the EA and SDC imagine that Bridgwater will not want to grow beyond the line of the barrier over the next 100 years or that a critical piece of infrastructure should be located so close to the town. Shouldn’t someone have asked how big will Bridgwater be in 100 years? The whole BTB project appears to have now deteriorated to the justification of an original poor decision. It is most disappointing. The information the ratepayer has seen to date raises questions of transparency or competency neither of which seems to have been achieved or available to any degree. Ratepayers should not be paying for all the people involved in the BTB project and the broader Somerset Flooding issues to be learning on the job which seems to be the case. Its well past the time that the Bridgwater Tidal Barrier including its location is independently reviewed before it is presented to the ratepayer one last time. 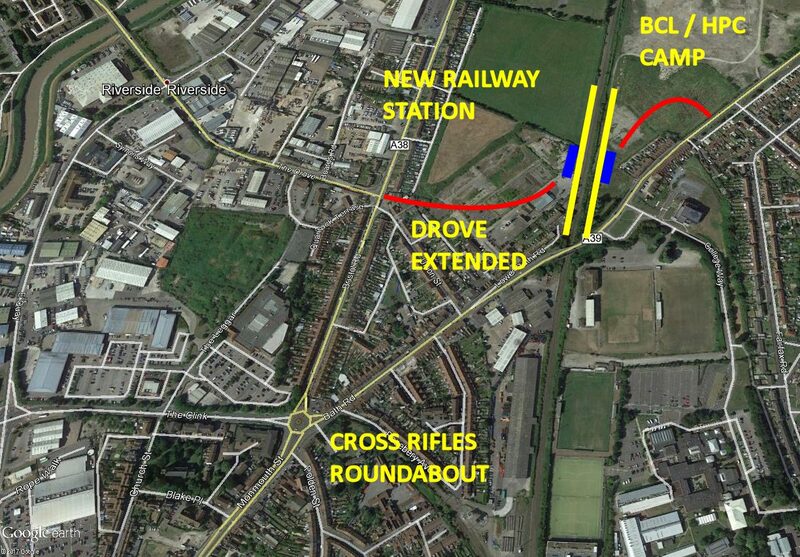 Its time we considered moving the Bridgwater Tidal Barrier downstream to Combwich. transparency with regard to cost and economic impact. what happens at the end of the 100 year design life; Bridgwater Tidal Barrier 2? clearly needs to be looked at as the information previously provided to the public and one assumes our councillors did not reach the standards we should expect and was wrong. Projects do not suddenly almost double in price in 15 months without good reason. The defence of the cost increase presented in the interviews was as unacceptable as the scheme itself has now become. The Environment Agency (EA) like the many political parties with the word Democratic in their title seems ever farther away from what people imagine the organisation to be about. Protecting the Environment and the people seems not to be one of them if it gets in the way of its long term Parrett Estuary agenda at Chilton Trinity north of Bridgwater. However any doubts that the EA doesn’t have a sense of humour or understands irony was firmly dispelled by its latest offering to the Chilton Trinity landowners. These are landowners whose land is impacted by downstream works resulting from planned construction of the £100M Bridgwater Tidal Barrier close to the town rather than is conventional practice at the mouth of the River Parrett. In March 2018 each landowner was the recipient of a document called BRIDGWATER TIDAL BARRIER DOWNSTREAM FLOOD DEFENCES Landowner information Pack. The EA’s apparent lack of understanding of the impact of salt water flooding onto farm land. is worrying. The expected floodwater is not like 2014 when the water that covered the Somerset Levels was predominantly fluvial run off (freshwater). This will be seawater coming up the River Parrett from the Seven Estuary that over tops the river banks. This document also asks farmer’s to allow the Environment Agency to dig borrow pits in the land the EA are meant to be protecting. Borrow Pits are meant to be refilled with other less suitable soil so it does not lessen traffic as the EA claim but only if they are left as just open pits in which case they aren’t borrow pits. Do we really need to excavate the land we are meant to be protecting? The alternative is a sustainable construction method that also seems to be a low priority of the EA. Construction of the bank improvements could be phased over a number of years using local contractors and material reclaimed from new developments. The proposed pits will hold the seawater (saltwater) rather than see it quickly flushed away back to the river. Saltwater is poison to agricultural land and the habitat we currently have in Chilton Trinity. These pits will, according to the trial embankment test done for the Cannington Bends improvement scheme, need to be reopened or enlarged every 35 years of so to make up the levels as the made up river banks settle. The EA promise going forward regarding maintaining bank levels quite rightly only talks about intent; the EA cannot provide a firm promise however they do know that once the land is poisoned the cost for further expenditure on bank raising will not be justified. No one can say that the EA does not have a sense of humour especially when the Chilton Trinity farmers are encouraged by the EA to act as turkeys to vote for Christmas. The EA’s long term ambition of an inter tidal habitat remains our pantomime villain – he is behind us and we chose not to look around and see him. Whilst appearing to help the EA are actually creating a self fulfilling prophecy that will see the area become salt marsh. Confirms the level of protection they are planning to maintain to farm land is very low. Omitted the future flood maps. Omitted to mention that the flood water will be seawater . Encourages the formation of borrow pits (actually just pits) that, when the banks of the River Parrett are overtopped, will trap seawater and ultimately destroy the value of the land its meant to protect. Destroying wildlife and fauna in the process that cannot handle saline conditions A case of the medicine killing the patient. 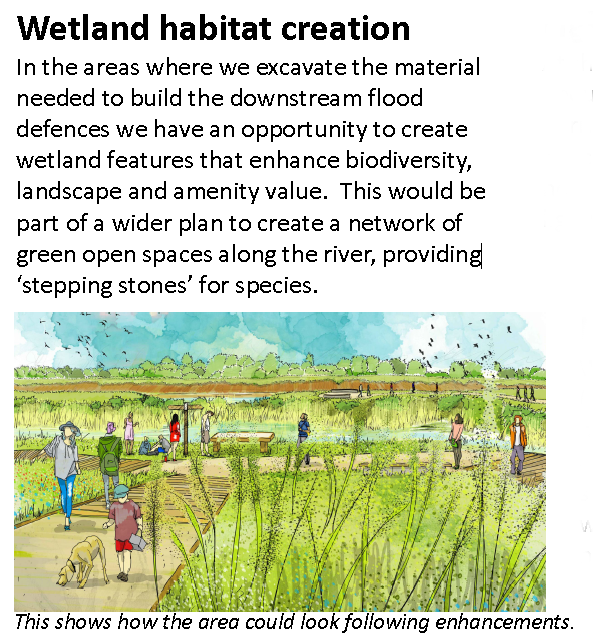 Creates through the use of borrow pits mores areas of stagnant water that in our warming climate will be a breeding ground for insects, one of the reasons given for not damming the River Parrett. Fails to mention the pits will need to be used and extended at least 3x as according to the embankment trial the river banks will need raising every 35 years. Does not mention the final height of the river banks in 100 years’ time, for every metre raised the bank get wider by 2 x 4.0m and the banks will need to be raised by around 0.80m. (2’6″) excluding the continued settlement of the river banks that always means 2 steps forward and always 1 step back. Re-confirms that agricultural land will be preferentially flooded. The EA commitment is qualified as only an “intent” . Will SDC ratepayers pay for the maintenance when they don’t get anything back? It’s a huge liability that SDC could end up with that has no benefit to the town. In a very short period of time, the cost of maintaining river banks to protect a small area of land and some ponds (flooded borrow pits) will not be considered worthwhile. No one can say we were not warned about this EA scheme and still no one asks what happens after the proposed scheme, the Bridgwater Tidal Barrier, can no longer counter rising sea levels? Diverting migrating elvers away from their normal route to our freshwater river system into the Steart Peninsula scheme. Planning to build a tidal barrier as far inland and upstream as possible contrary to all normal accepted good practice. As this slow-motion environmental, and for Bridgwater, and economic car crash occurs we should not forget that three prominent members of the Wessex Regional Flood and Coastal Committee live within a mile or so of where this unnecessary and increasingly misrepresented process is going on. No objection or question is heard regarding the impact of the EA Scheme; there is no visible oversight.